Have you ever wanted to study the gospels and the life of Jesus chronologically? You can do this with the Olive Tree Harmony of the Gospels. This unique harmony allows you to read the gospels in chronological order with parallel accounts viewable side-by-side for easy comparison. The harmony is divided into over 250 events in the life of Christ. The chronology is primarily ordered based on Mark and Luke's gospels with Matthew and John's accounts harmonizing with them, creating a seamless reading experience. 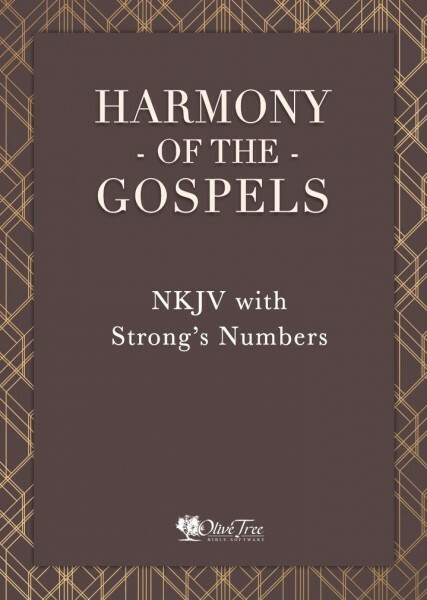 A full index of the titles and passages is included at the end for a quick overview of the harmony. The Olive Tree Harmony of the Gospels is a harmony built with the mobile experience in mind. When viewed in a horizontal layout on a larger device like a tablet you can view all (4) columns side-by-side. The side-by-side view scales down two a two or single column view as the horizontal viewable area gets smaller, or when Resource Guide is opened. The well-known Strong's Exhaustive Concordance lists all the significant words in the Bible and references each word to the original Hebrew and Greek languages. The concordance was first published in 1890 by Dr. James Strong, whose life's work was to provide students of the Bible with an accurate and functional tool to understand the Bible's original language. He and others worked on the list for 35 years without the aid of today's technology. Dr. Strong's work is still universally recognized as one of the essential aids for studying the Bible. Note: This resource is best viewed using up/down (flick) scrolling. Upgrade Pricing Available! If you've previously purchased the NKJV or any Olive Tree collection or bundle that contains it, you can purchase this item for a special upgrade price. The upgrade price will be visible when you log in to your Olive Tree account and add the item to your cart (NOTE: Upgrade pricing is only available on www.olivetree.com, and not via in-app purchase).